This example shows how to look at and explore 3-D volumetric data using the Volume Viewer app. 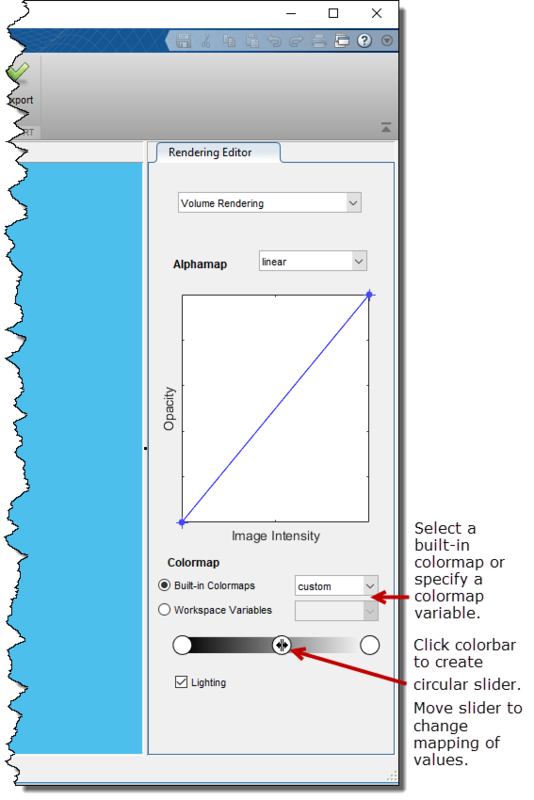 Volume rendering is highly dependent on defining an appropriate alphamap so that structures in your data that you want to see are opaque and structures that you do not want to see are transparent. 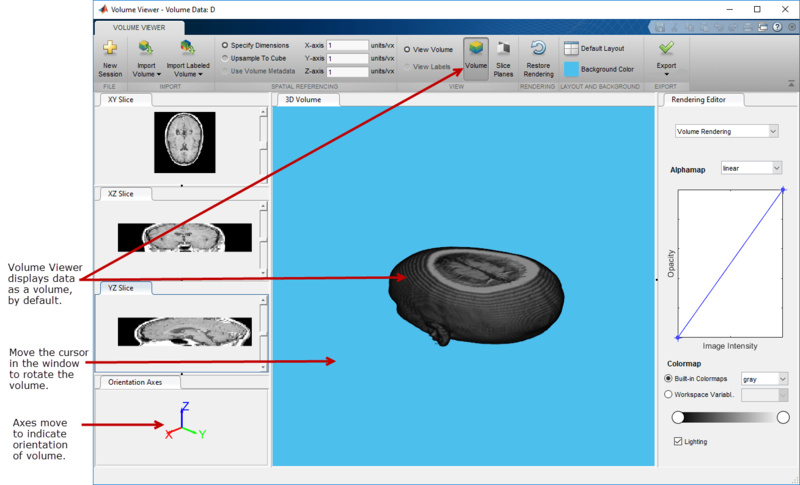 To illustrate, the example loads an MRI study of the human head into the Volume Viewer and explores the data using the visualization capabilities of the Volume Viewer. This part of the example shows how to load volumetric data into the Volume Viewer. 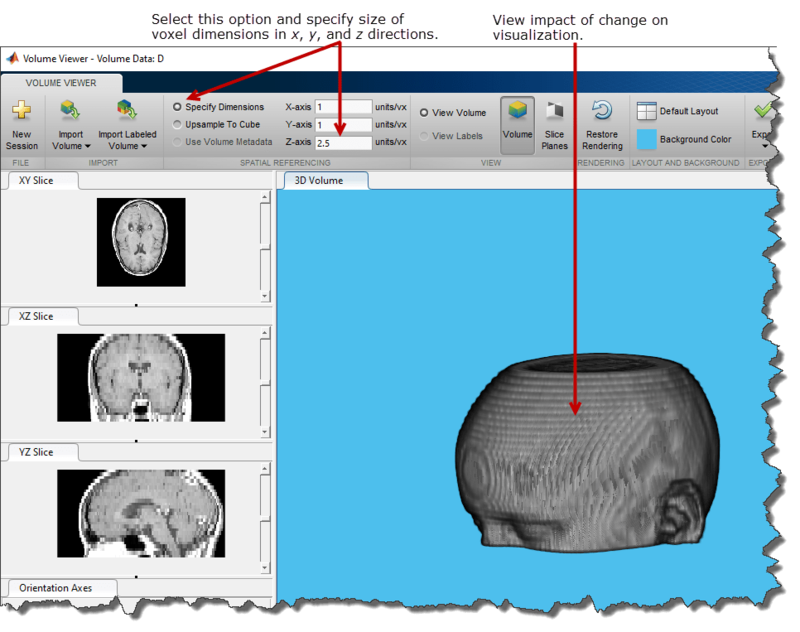 Load the MRI data of a human head from a MAT-file into the workspace. This operation creates a variable named D in your workspace that contains the volumetric data. Use the squeeze command to remove the singleton dimension from the data. Open the Volume Viewer app. From the MATLAB® Tool strip, open the Apps tab and under Image Processing and Computer Vision, click . You can also open the app using the volumeViewer command. Load volumetric data into Volume Viewer app. 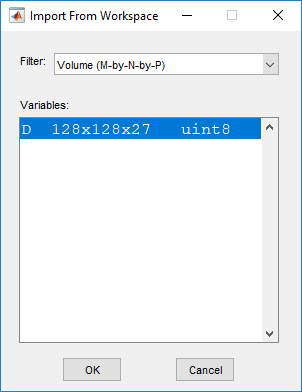 Click Import Volume. You can load an image by specifying its file name or load a variable from the workspace. 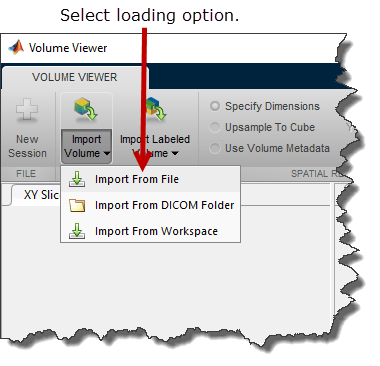 If you have volumetric data in a DICOM format that uses multiple files to represent a volume, you can specify the DICOM folder name. Choose the Import From Workspace option because the data is in the workspace. Select the workspace variable in the Import from Workspace dialog box and click OK. In this part of the example, you decide how you want to view your data. The Volume Viewer offers several options. View the volume in the Volume Viewer app. By default, the Volume Viewer displays the data as a volume but you can also view it as slice planes. 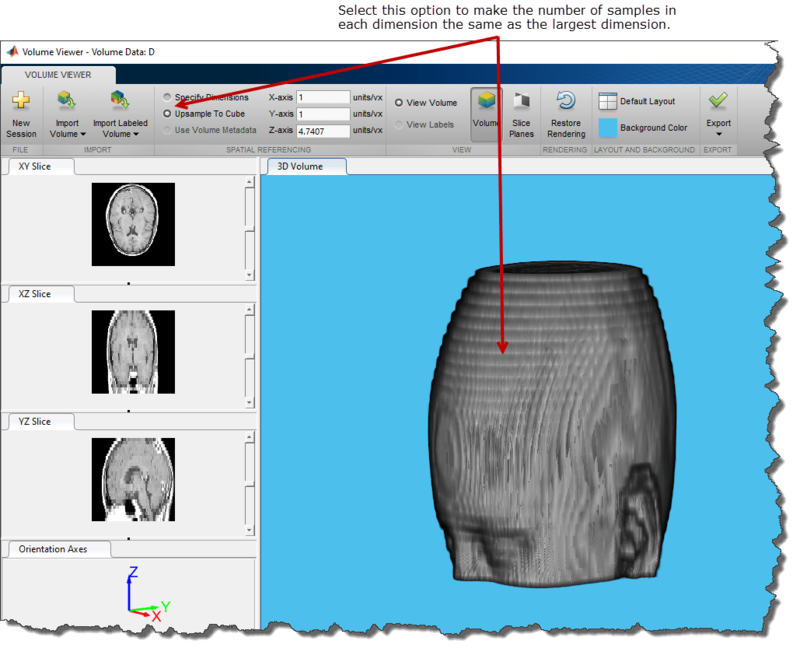 The MRI data displayed as a volume is recognizable as a human head. To explore the volume, zoom in and out on the image using the mouse wheel or a right-click. You can also rotate the volume by positioning the cursor in the image window, pressing and holding the mouse, and moving the cursor. You are always zooming or rotating around the center of the volume. The position of the axes in the Orientation Axes window reflects the spatial orientation of the image as you rotate it. 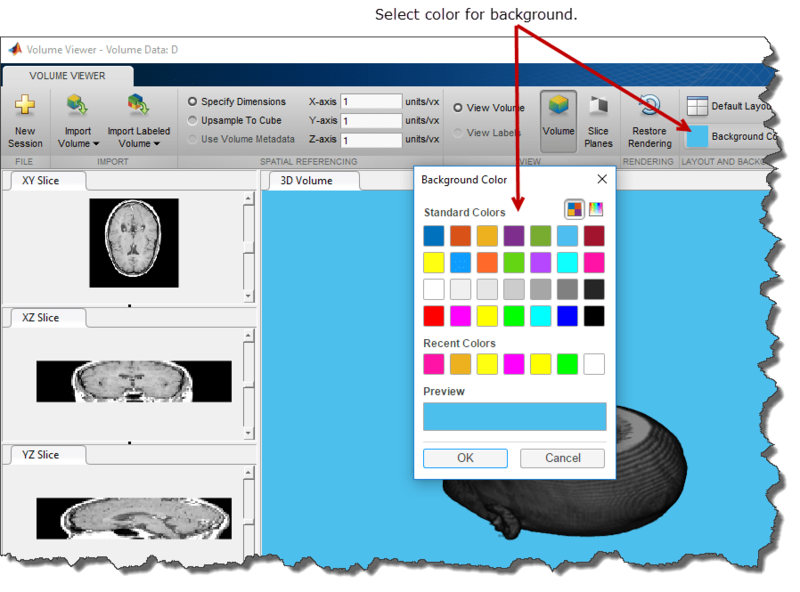 To change the background color used in the display window, click Background Color and select a color. 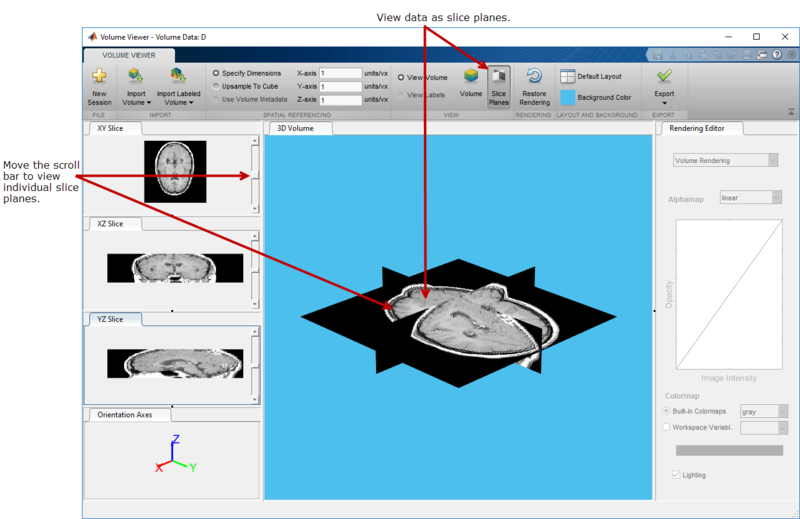 View the MRI data as a set of slice planes. Click Slice Planes. You can also zoom in and rotate this view of the data. Use the scroll bars in the three slice windows to view individual slices in any of the planes. Continue using Volume Viewer capabilities until you achieve the best view of your data. In this part of the example, you adjust the view of the volumetric data in the Volume Viewer app. Specify Dimensions--You can specify the dimensions in the X, Y, and Z directions. 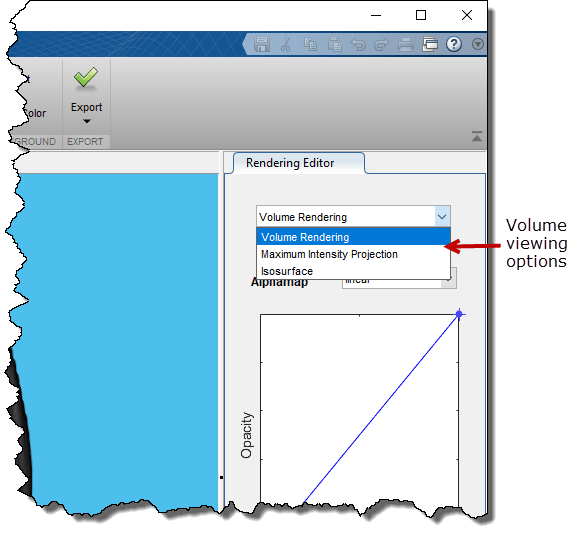 Upsample To Cube--The Volume Viewer calculates a scale factor that makes the number of samples in each dimension the same as the largest dimension in the volume. This setting can make non-isotropically sampled data appear scaled more correctly. Use Volume Metadata--If the data file includes resolution data in its metadata, the Volume Viewer uses the metadata and displays the volume true to scale. The Volume Viewer selects the Use Volume Metadata option, by default, if metadata is present. Choose the overall viewing approach: Volume Rendering, Maximum Intensity Projection, or Isosurface. 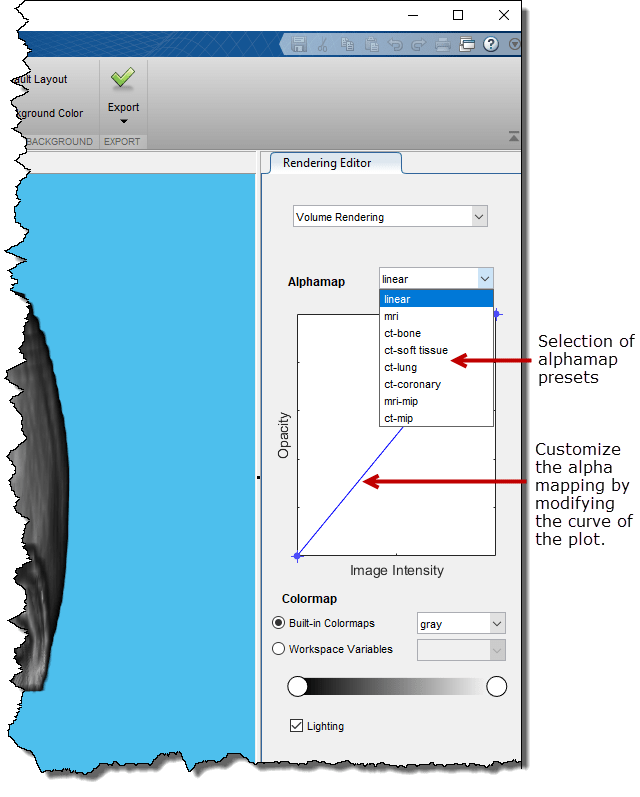 Modify the alphamap by specifying a preset alphamap, such as ct-bone, or by customizing the alphamap using the Opacity/Image Intensity curve. Specify the colormap used in the visualization. Specify the lighting in the visualization. The Volume Viewer offers several viewing approaches for volumes. The Maximum Intensity Projection (MIP) option looks for the voxel with the highest intensity value for each ray projected through the data. MIP can be useful for revealing the highest intensity structure within a volume. You can also view the volume as an Isosurface. Volume rendering is highly dependent on defining an appropriate alphamap so that structures you want to see are opaque and structures you do not want to see are transparent. The Rendering Editor lets you define the opacity and transparency of voxel values throughout the volume. You can choose from a set of alphamap presets that automatically achieve certain well-defined effects. For example, to define a view that works well with CT bone data, select the CT Bone rendering preset. By default, the Volume Viewer uses a simple linear relationship, but each preset changes the curve of the plot to give certain data value more or less opacity. You can modify the alphamap by manipulating the plot directly. Color, when used with voxel intensity and opacity, is an important element of volume visualization. In the Rendering Editor, you can select from a list of predefined MATLABcolormaps, such as jet and parula. You can also specify a custom colormap that you have defined as a variable in the workspace. You can also change the color mapping for any colormap by using the interactive colorbar scale. For example, to lighten the color values in a visualization, click on the colorbar to create a circular slider. To modify the color mapping so that more value map to lighter colors, move the slider to the left. You can create multiple sliders on the colorbar to define other color mappings. Modify lighting effects. By default, the Volume Viewer uses certain lighting effects on the volume display. You can turn off these lighting effects by clearing the Lighting check box.